GOLDEN, Colo. --- The South Dakota School of Mines men's basketball team put up some impressive shooting numbers Saturday night but couldn't slow the red hot No.6 nationally ranked Colorado School of Mines and the Orediggers took down the Hardrockers, 94-67, during a Rocky Mountain Athletic Conference matchup in Golden, Colo.
Colorado School of Mines took a 12-point halftime lead, 44-32, and then outscored SD Mines, 50-35, over the last 20 minutes to earn the win. 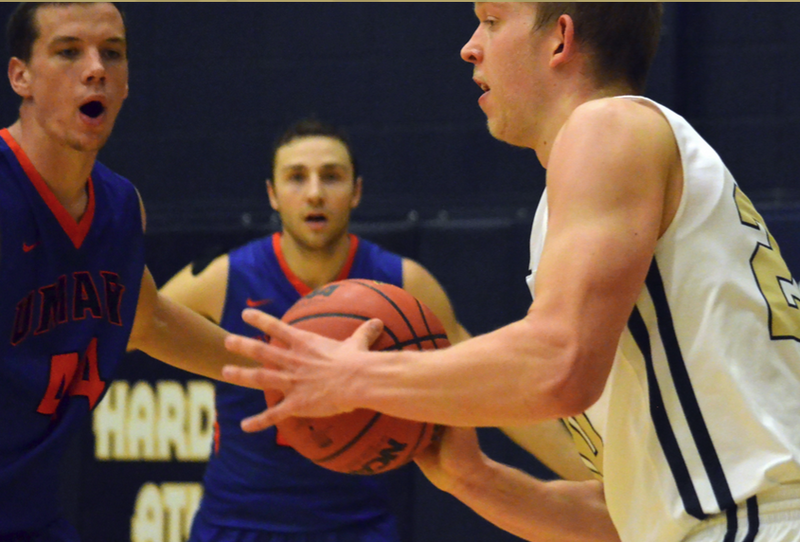 The Hardrockers shot 47.2 percent from the field hitting 25-53 attempts, including 6-12 from the three-point range and 11-14 from the free throw line. SD Mines had 19 rebounds, 16 assists and one steal. The Colorado School of Mines couldn't miss Saturday, making good on 35-57 shots for 61.4 percent, which including 9-16 from behind the arc and 15-18 from the foul line. The Orediggers posted 35 rebounds, 22 assists, six steals and two blocked shots. Individually for the 'Rockers, sophomore Logan Elers paced his team with 16 points and five rebounds. Freshman Troy Brady tacked on 13 points and recorded five assists while sophomore Jake Heath and senior Brian Orr both contributed with 10 points. The Orediggers were led by Ben Clare with 20 points, while Michael Glen and Luke Schroepfer both cashed in for 13 points. The loss drops SD Mines back .500 with a 3-3 record and are 2-2 in conference play. The Hardrockers are back home this weekend to challenge Chadron State College Friday and Regis University on Saturday. Meanwhile, The South Dakota School of Mines women's basketball team put up a good fight but couldn't keep pace with the Colorado School of Mines Saturday evening as the Hardrockers fell to the Orediggers, 77-59, during a Rocky Mountain Athletic Conference matchup in Golden, Colo.
Second-change opportunities was the Lady Hardrockers' downfall as Colorado School of Mines notched 21 offensive rebounds on the night and converted 16 points for the home team. The Orediggers outscored SD Mines, 15-8, in the opening frame and then bettered the visitors, 22-17 in the second quarter and went into halftime with a 12-point edge, 37-25. SD Mines couldn't get over the hump in the second half as Colorado School of Mines cashed in for 40 points while the 'Rockers posted 34 markers. SD Mines finished the game shooting 32.1 percent from the field making good on 18-56 attempts, including 11-28 from the three point line and added 12-15 from the free throw line. The 'Rockers collected 37 rebounds, had 14 assists, two steals and one block. The Orediggers were 32-81 from the field to shoot 39.5 percent, which included 9-25 from behind the arc and 4-5 from the foul line. They totaled 52 rebounds, had 20 assists, 12 steals and six blocks. Individually, SD Mines freshman Michaela Shaklee led her team with 10 points, two rebounds and one block. Junior Taylor Molstad, sophomore Sami Steffeck and freshman Ryan Weiss all contributed with nine points each. The Orediggers were paced by Anna Kollmorgen with 16 points, Cassidy Budge had 13 markers and Heidi Hammond tacked on 11 points. The loss dropped the 'Rockers to 6-3 on the season and 2-2 in the RMAC. SD Mines is back home this weekend to take on Chadron State College on Friday and Regis University Saturday afternoon.